If you’re looking for an extraordinary experience on a trip to Europe, make your way to the shores of the pristine Wolfgangsee lake, in the Austrian Alps. 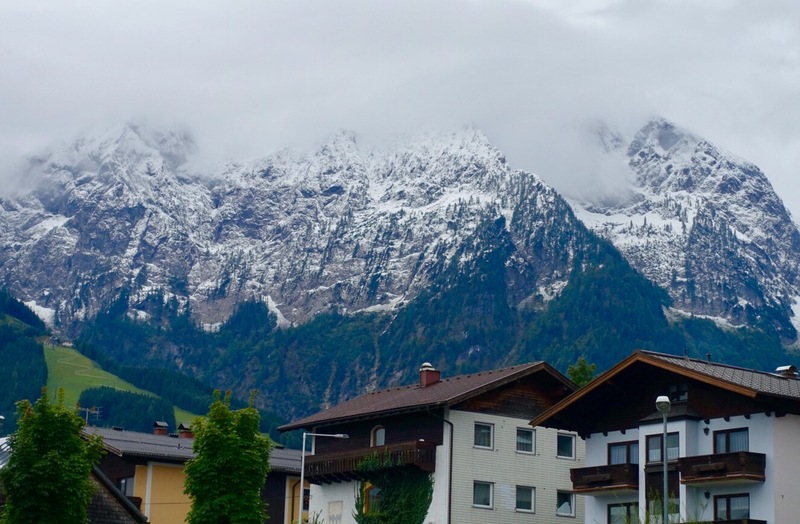 Overshadowing the picture-postcard alpine town of Sant Wolfgang am Wolfgangsee is Schafberg Mountain, a towering peak in the Salzkammergut Range. Schafberg Mountain is rather special because, since 1893, it has been the site of one of the steepest steam-powered cog-railways anywhere in Europe. Schafbergbahn railway carries visitors to the summit of the mountain 1,783 metres above the surrounding countryside. This is truly one of the world’s great travel experiences: memories of which will live with you forever. The railway winds out of the quaint village; passes through the treeline; disappears into the clouds; and emerges in the snow zone. Once at the summit, it feels like you are on the top of the world. Visitors are greeted by incomparable 360 degree views across the majesty of the Alps and their many glacial lakes. If you want to soak up more of the views and watch the sun set between rugged mountain peaks, the summit boasts a hotel called Schafbergspitze – commonly known as the ‘hotel in the clouds’ – which has operated through the summer months since 1862. Here you can sip wine and watch one of nature’s most stunning shows – the sun setting through the alpine mountain peaks. Rays of golden light bounce from one snow-capped Alp to another, glinting off the lakes far below and highlighting the birds gliding well down the slopes. Hotel Schafbergspitz boasts a a bar perched high on an adjoining mountaintop and, at the very peak of the area, a wooden cross stands as a reminder of the dangers of venturing too close to the edge. Schafberg Mountain with its steam train and hotel is located at Wolfgangsee lake in the Austrian Alps. It is about an hour’s drive from the city of Salzberg. There is also ample accommodation in Sant Wolfgang am Wolfgangsee or you can do as we did: stay in another of the small nearby villages, to truly experience Austrian alpine culture and communities. Regardless of how you do it, the Schafberg Mountain is an experience of a lifetime that you will never forget or regret. Church bells toll in the distance, snow has started to fall on the Alps almost across the road and mist and low cloud is rolling across the vivid green alpine meadows. 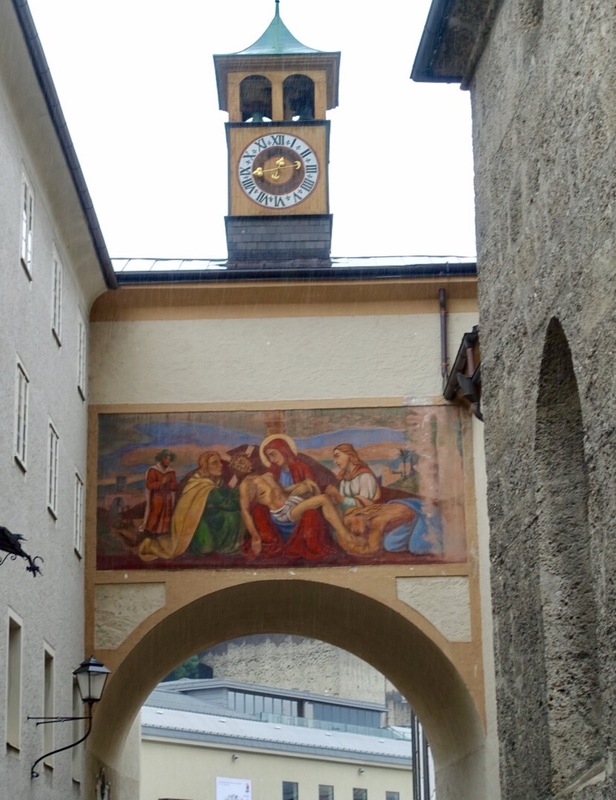 The town of Puch bei Hallein snuggles into the hillside about 20 minutes from the Austrian city of Salzberg. Combining the alpine scenery of the Salzberg area with ancient village atmosphere, Puch bei Hallein is an ideal base to explore the beautiful surrounds. We’ve gathered for a reunion with our Danish family at one of the area’s man-made gems, the luxurious family Hotel Gasthof zum Kirchenwirt. 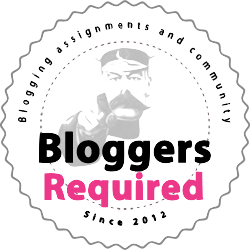 Watch for our upcoming review of this hotel. The hotel seems to be only a stone throw from the craggy and breath-catching Alps, where lights twinkle from tiny villages and an increasing amount of snow coats the peaks and tallest slopes. There’s a chance of more snow – much to our delight. 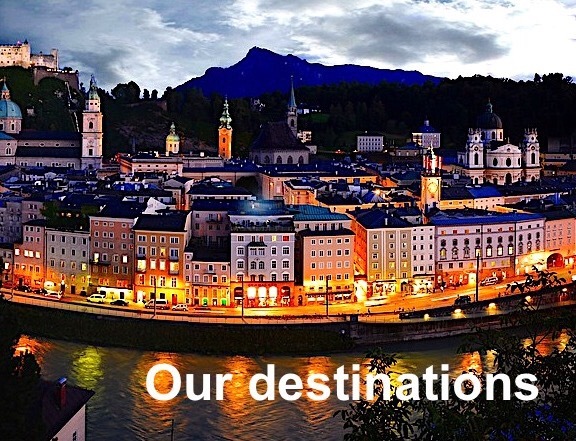 We’d love to see the white Salzberg region shown on the postcards sold by the thousands. 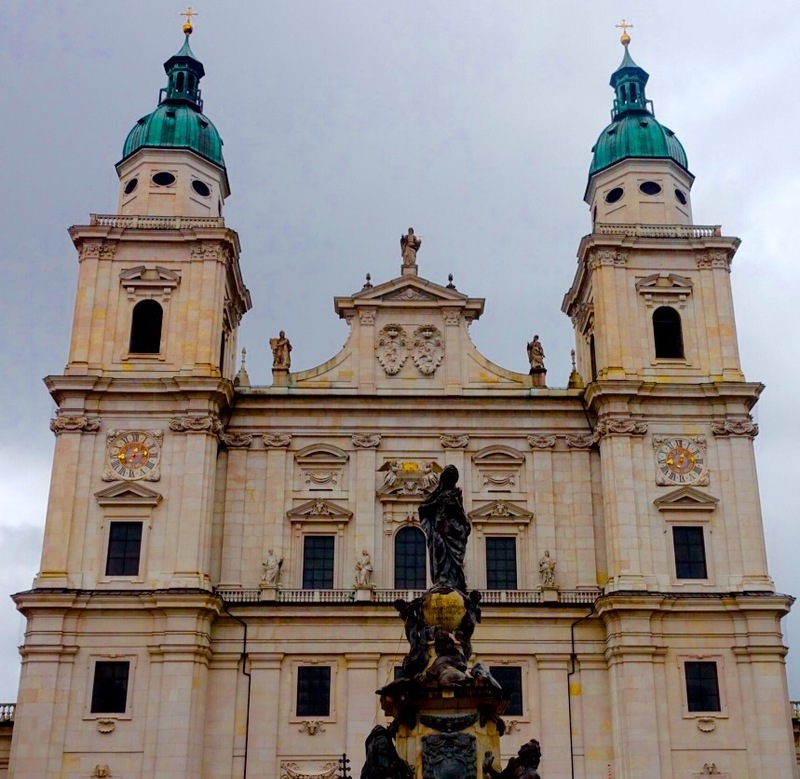 Yesterday, we wandered into Salzberg’s Old Town, braving light drizzle to see the well-preserved castle; the Salzberg Dom cathedral; and the the general fairytale charm of the Baroque city. 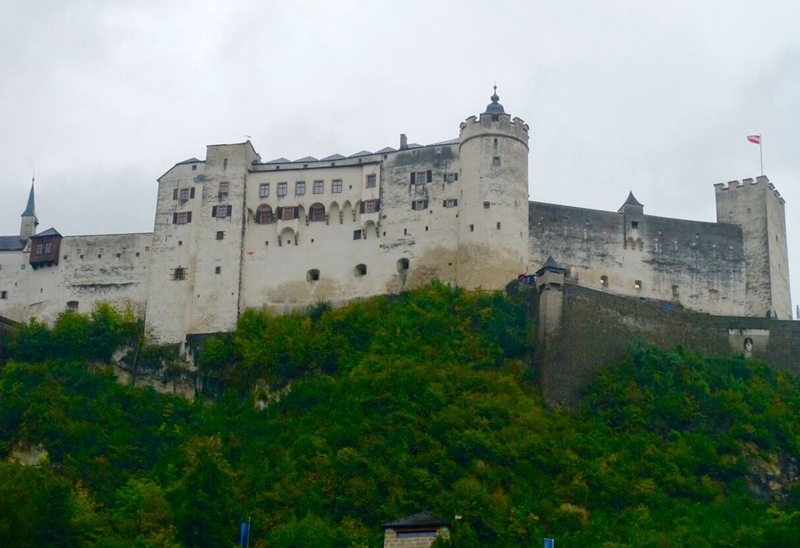 Hohensalzburg Castle is one of the biggest medieval fortresses in Europe and dates to 1077. The cathedral is also an imposing sight, linked by three ‘cathedral arches’ to St Peter’s Abbey and Salzberg Residenz, the former palace of the Archbishops who ran the city in years gone by. Meandering through the Old Town, we appreciated the ‘Durchhäuser’ – old passageways through buildings that you can use as a sort of shortcut. 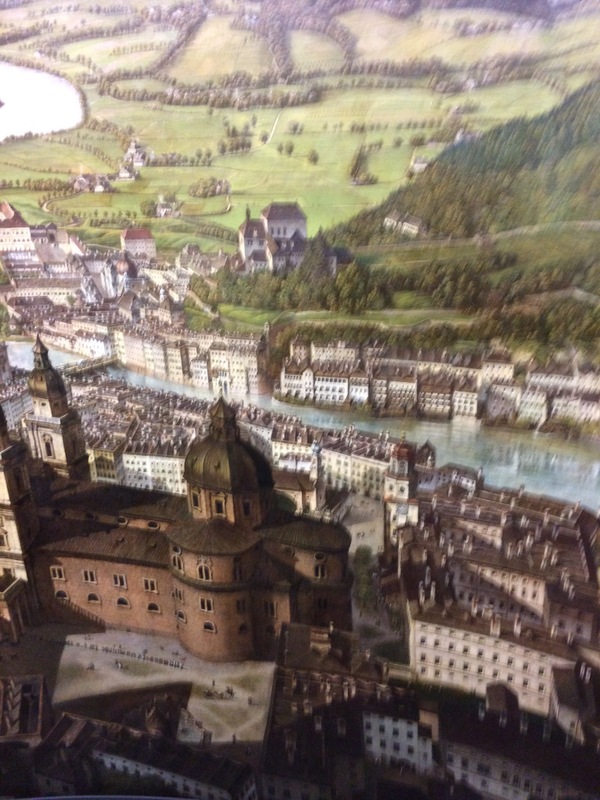 We made our way to Salzberg Museum, largely to see a 360 degree panorama of Salzberg, painted by Johann Sattler, over three years in the 1820s. At over 1,300 square feet, the huge panorama portrays Salzburg and the surrounding areas in detail as seen from the top of Salzburg castle. This panorama was a popular attraction at the time of its completion, and travelled across Europe in the 19th century drawing big crowds. In today’s age of ‘Pano’ settings on cameras and many smart phones, this painted version was fascinating in its detail and craftsmanship. Today, we had an extraordinary experience, travelling 210 metres below the Alps, down what’s said to be Europe’s oldest salt mine. The mine, at Mount Durrnberg on the Austria-German border, was used by the Celts to mine salt more than 2,500 years ago. After donning white overalls (not exactly a fashion statement) we first rode a miners train 400 metres down the mine shaft. We then followed a guide and walked to a lower level, before going even deeper on the ‘miners slide’ – which was rather like giant wooden slippery dips. Next came brine tasting, before we went on a boat ride across an underground salt lake. 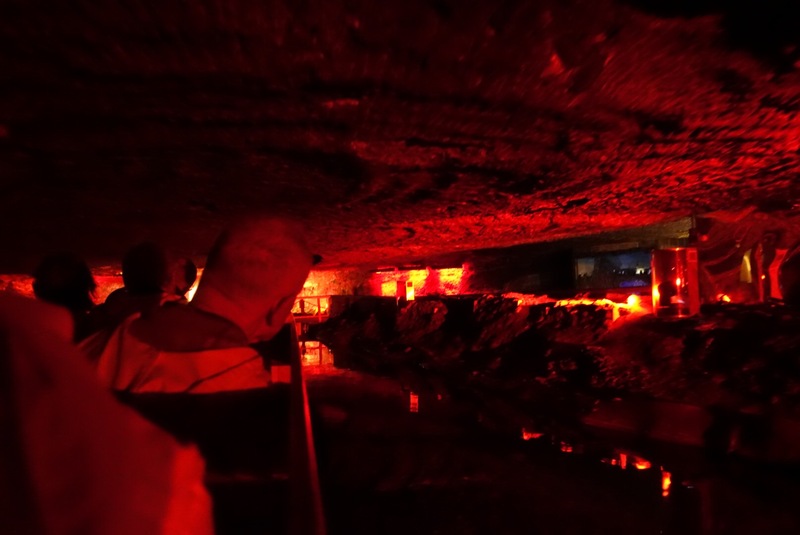 As we travelled through the mine we crossed into Germany – and our guide and multi-media presentations explained how the wealth, splendour and even the name of Salzberg came from the mining and sale of salt – known as ‘white gold’. 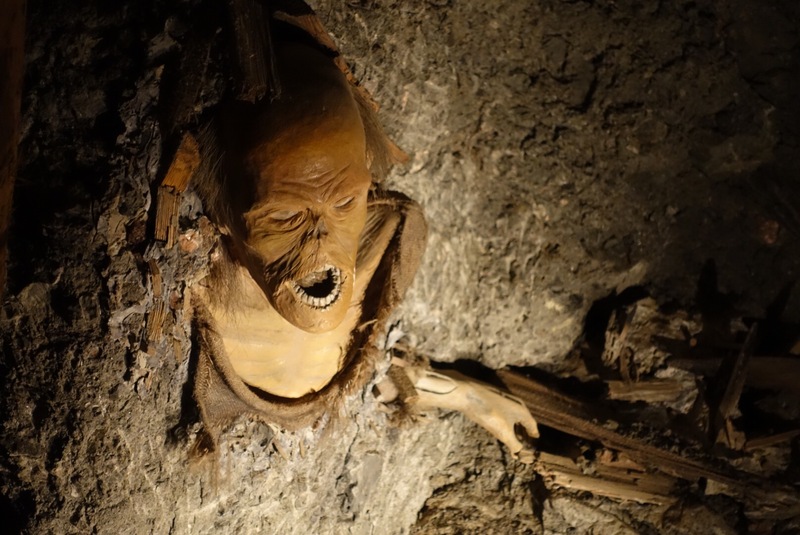 We were then shown where the body of a Celt man had been discovered preserved in salt- and before we returned to the surface, each of us was given a small salt souvenir. The visit to the mine was a wonderful experience that we will never forget. Afterwards, we went to the very foothills of snow-capped Austrian Alps for a beer in the village of Abtenau. Tomorrow, we will explore the beautiful St Wolfgang area of Austria. 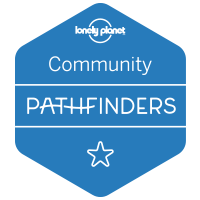 Follow our journey! If you enter the words “elegance” and “romance” into Google, there’s a good chance the answer will be “Vienna”. Throw in sophistication, culture, history and coffee houses and you’re getting close to the charm of the Austrian capital on the Danube. A cityscape characterised by magnificent baroque buildings has something for everyone – from outstanding museums and galleries; striking palaces; a famous opera house; and the gothic Stephansdom, or St Stephen’s Cathedral. Culture oozes from the cobblestones walked at times by the likes of Beethoven, Strauss, Mozart and Haydn. Today, the Vienna Philharmonic Orchestra is world famous, as is the Vienna Boys Choir. Stunning Schoenbrunn Palace – with its Gloriette monument, maze; Palm House and zoo – is recognised instantly, as is the eye-opening Hofburg Imperial Palace. And tucked between the famous buildings is the quaint Vienna beloved by the locals, with coffee houses, tea rooms and wine taverns standing side-by-side with modern restaurants and shops. Whatever your taste, Vienna is a feel-good city. The uniquely Viennese charm is the perfect medicine for whatever ails you. You lose your breath at the beauty of Italy; you marvel at the grandeur of London; you glow at the romance of Paris; and you sway to the beat of New York City. In Vienna, you feel a better person just for visiting. Whether they’ve ever been to the opera or not, most people have marvelled at an opera house or two. Throughout the world, opera houses are among the most gorgeous and significant buildings imaginable. Empress Maria Theresa of Austria founded Milan’s legendary opera house in 1778. It is an awesome building, perfectly in keeping with Milan’s reputation for class, quality and refinement. 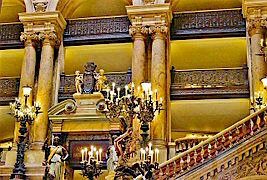 Probably the most famous opera house in the world, in no small part because of its setting for the novel and musical, Phantom of the Opera, this opulent building was a key part of the Paris of the Grand Boulevards, designed under Emperor Napoleon III. It is now used mainly for ballet. We have been fortunate to visit several times. Don’t miss this one if you are visiting beautiful Paris. An opera house has stood on the present location at Covent Garden since the early 18th century. Designed in the English Baroque architectural style, the building’s façade, foyer, and auditorium date from 1858. Located in the centre of Vienna, this stately building was originally called the Court Opera. In 1920, with the replacement of the Habsburg Monarchy by the First Republic of Austria, it was renamed the Vienna State Opera. Members of the world famous Vienna Philharmonic are recruited from its orchestra. A tour of Wiener Staatsoper is a traditional highlight of a visit to Vienna. Copenhagen Opera House is the national opera house of Denmark and among the most modern in the world. It is said to have cost more than US$500 million and sits on the island of Holmen in central Copenhagen. Located on the Unter den Linden boulevard in the Mitte district of Berlin, this opera house originally dates to 1741. Destroyed by bombing in World War II, it reopened in baroque style in 1955. One of the most famous and renowned landmarks in the history of opera, this striking building marks the site of Venetian theatres that date back to the 1730’s. In the 19th century especially, La Fenice became the site of many famous operatic premieres. It is one of the best known buildings in the beautiful city of Venice. Opened in 1888 as the New German Theatre, this building is now officially known as the Prague State Opera. About 300 performances are staged here each year. Other notable European opera houses that we haven’t visited include the Bolshoi in Moscow, Russia (shown below this paragraph); the Teatro Di San Carlo in Naples, Italy; the Opera Royal de Versailles in France; and the Hungarian State Opera House in Budapest. If you are visiting Vienna, make sure you find time to visit the city’s grand opera house, which hosts one of Europe’s most glittering social events each year. In February, the internationally-renowned Vienna Opera Ball is staged – an event that attracts visitors from around the world, notably prominent names in business, show-business and politics. The red carpet event, which is deemed the epitome of Ball culture, is more than years old. However, you don’t need to attend the annual Ball to appreciate the magnificent Weiner Staatsoper, a 146-year-old building located on Vienna’s Ringstrasse Boulevard. We toured the building on our last visit – and were enthralled by the stately stone exterior and the neo-renaissance style inside. A highlight of the interior is an area known as the Tea Salon, which was formerly the Emperor’s Salon. The ceiling and walls of the former Imperial Box are decorated with 22 carat gold leaf. We were also shown sculptures, magnificent wall embroideries from the Giani studio, and tapestries bearing the initials of former Emperor Franz Joseph I. The 120-metre intermission halls are also particularly striking and connect to frame the sweeping main staircase. Originally called the Weiner Hofopen or Vienna Court Opera, the building was renamed in 1920 when the Hapsburg Monarchy gave way to the First Republic of Austria. Damaged by World War II bombing, the Staatsoper was rebuilt to its former glory by 1955. We were told that the opera house is one of the busiest in the world, producing about 300 performances a year – broken down into 50 to 60 operas and 10 ballet shows. The main performance hall holds 2,100 and there is a giant screen on an outside wall designed to bring opera to the masses outside. Weiner Staatsoper is also known for its emphasis on providing music theatre and training for children. Naturally, such a prestigious opera house has featured many big named, including appearances by Maria Callas, Christa Ludwig, Placido Domingo, Jose Carreras and Luciano Pavarotti. Dodging the peak season crowds at Vienna, Austria, can be quiet an art. But, if you do a little exploring, there are some real gems in this most elegant of cities. One of Vienna’s finest attractions is the Hofburg Imperial Palace, with its striking architecture, statues and stables harking back to the luxury of the Hapsburg Empire. Reluctant to join busy organised tours of the palace rooms, we wandered instead around the cobblestone square and spied the Cafe Hofburg near one of the main gates. A quick check on Trip Advisor and we settled in for coffee and Apfelstrudel, as grand as any we’ve tasted in Austria. It was the perfect way to chill and avoid the bustle. Likewise with the Naschmarkt, a popular shopping/market area just outside Vienna’s Inner City. We spent some time there, but finally escaped to quieter side streets, where we were delighted to come upon Crossfield’s Australian Pub, on Maysedgasse 5. The pub not only serves typical Australian fare – including kangaroo burgers – but also boasts drinks such as ‘Kakadu Ale’ and the exotically-named ‘Snake Bite’, which we discovered was a ‘middy’ (about 285ml) of cider, accompanied by a middy of Forsters beer and raspberry. Each ‘Snake Bite’ cost a little more than five Euros and certainly had a different taste. Viennese cuisine is exceptional and the city boasts some of the finest restaurants you’ll ever encounter. We’ve tried traditional Wiener schnitzel (veal coated in breadcrumbs and fried) followed by Millirahmstrudel (milk-cream strudel) but, when last in Vienna, we fell back on an old ploy called ‘follow the locals’. Vienna university is located in the inner city and – knowing that students are usually able to sniff out a good, cheap meal – we followed a group of students to a small licenced cafe in the shadows of St Stephen’s Cathedral. There, we were able to get a hearty meal, accompanied by a few ales, for a particularly good price. 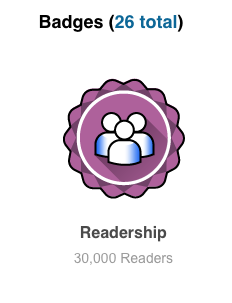 This ploy is thoroughly recommended. We’ve even eaten at university canteens, where the cost is usually very low. Another shopping area in Vienna that is popular with tourists is the MariahilferstaBe. We avoid the crowds by heading for the Raimundhof Passage, a cute little walkway that yields some lovely shops and destinations known mainly to the locals. One of our favourite stops down the passage is Sir Hardy’s Tea, an olde world tearoom that serves some awesome brews. Politically correct or not, zoos have allowed us to observe animals that we might never have seen otherwise – and helped us learn about important wildlife issues. 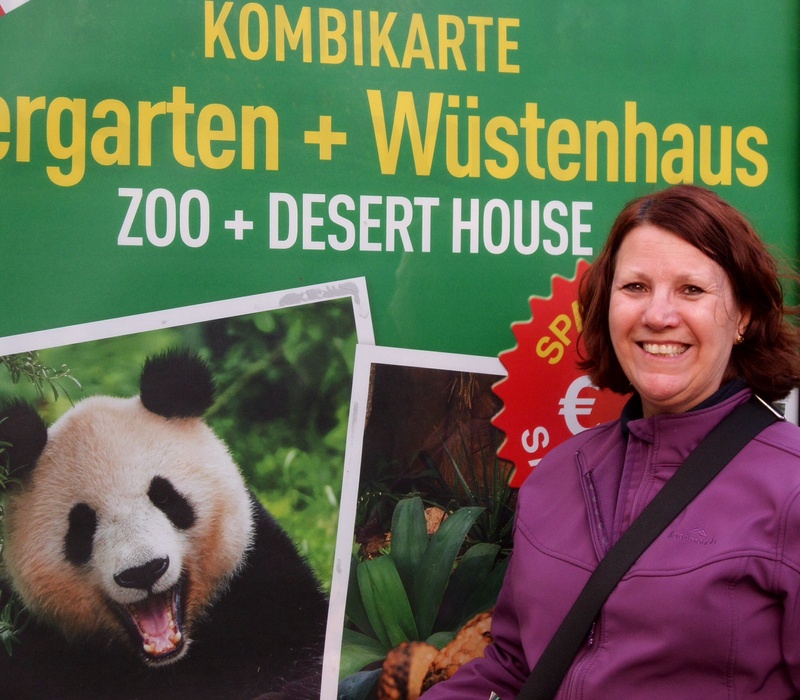 Take the Schonbrunn Vienna Zoo for example. 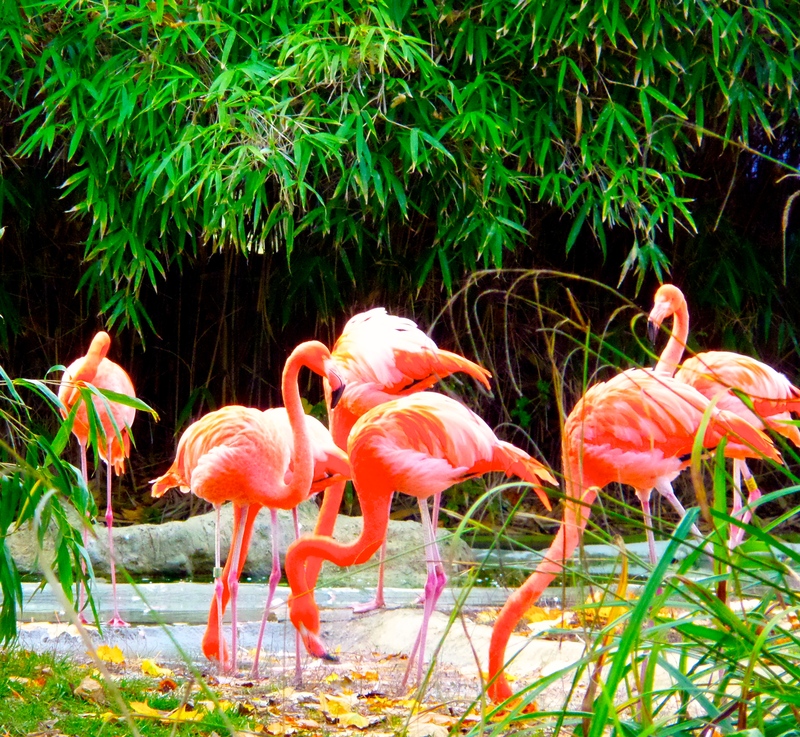 In a city blessed with marvellous attractions, this zoo is a stand-out: modern, educational and highly entertaining. Located in the grounds of the famous and majestic Schonbrunn Palace, the Vienna Zoo is said to be the world’s oldest, dating to 1752. Originally reserved for members of Austria’s Habsburg royal family, the menagerie was opened to the public in 1779. Emperor Joseph II organised expeditions to Africa and the Americas to procure specimens for the zoo, which now houses more than 500 species of mammals, birds, reptiles, amphibians, insects and fish. None of the zoo’s exhibits, however, are as rare as its popular Giant Pandas, originally named Yang Yang and Long Hui. There’s said to be only about 1600 of these bears left; most of them in China, either wild, in reserves or in captivity. 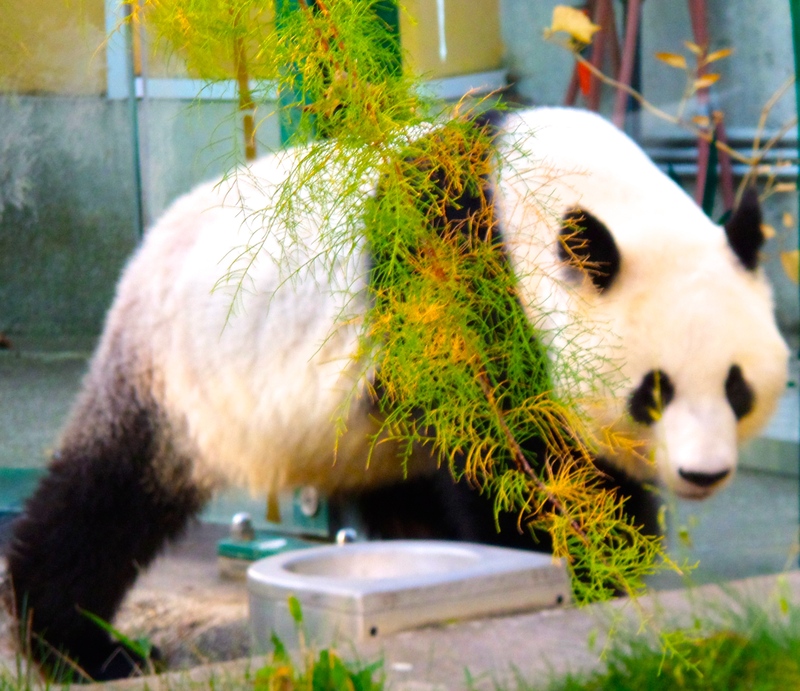 In 2003, the Chinese government loaned Yang Yang and Long Hui to the Republic of Austria for 10 years or more, with the zoo participating in the international panda breeding and research project. Last year, a baby panda was born at the zoo by natural conception. Feted like royalty on their arrival at Schonbrunn Vienna Zoo, the two adult pandas were promptly rechristened Sissi and Franz, after former Emperor Franz Joseph and his famous wife, Elisabeth. The crowd-drawing power of the Giant Pandas is astonishing. When we visited the zoo, there was an almost constant throng of people around the enclosure and a steady background whirl of cameras. Another popular area at Vienna Zoo is the orangutan education section, where these shaggy-haired apes can swing through the air as high as 11 metres above the ground, as well as scaling nets, ropes and trees – and, if you are lucky, gazing for a split second into the camera lens. 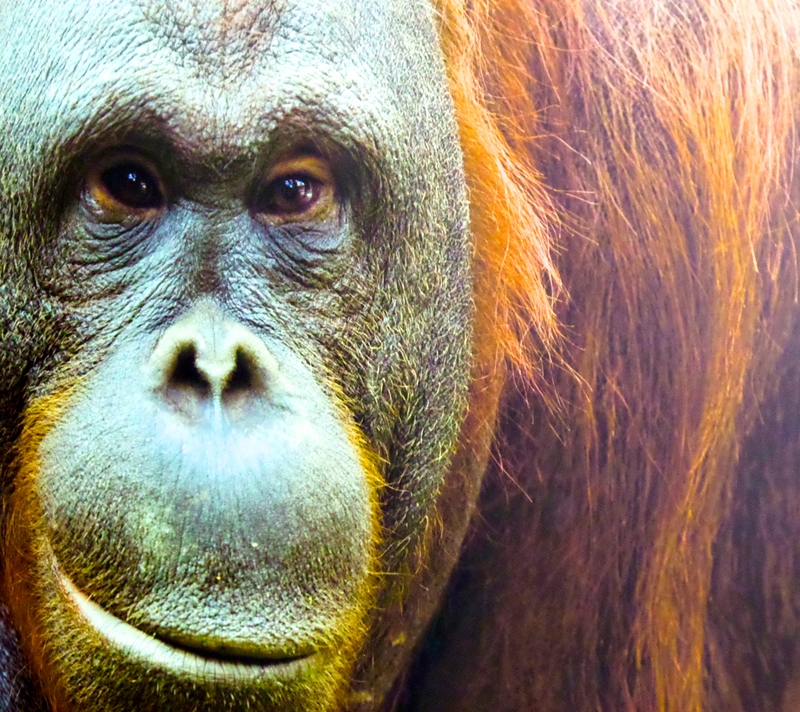 The zoo’s information center provides education material on the evolutionary history of orangutans, their lives and threats to the species. Schonbrunn Vienna Zoo is a maze of colour, sights and sounds – a wonderful assault on the senses. From Siberian Tigers to lumbering elephants, hippos, Rhinos, polar bears, a rainforest trail, desert house, aquarium and flocks of pretty flamingoes, there’s something to see at every turn – making this a truly memorable destination. 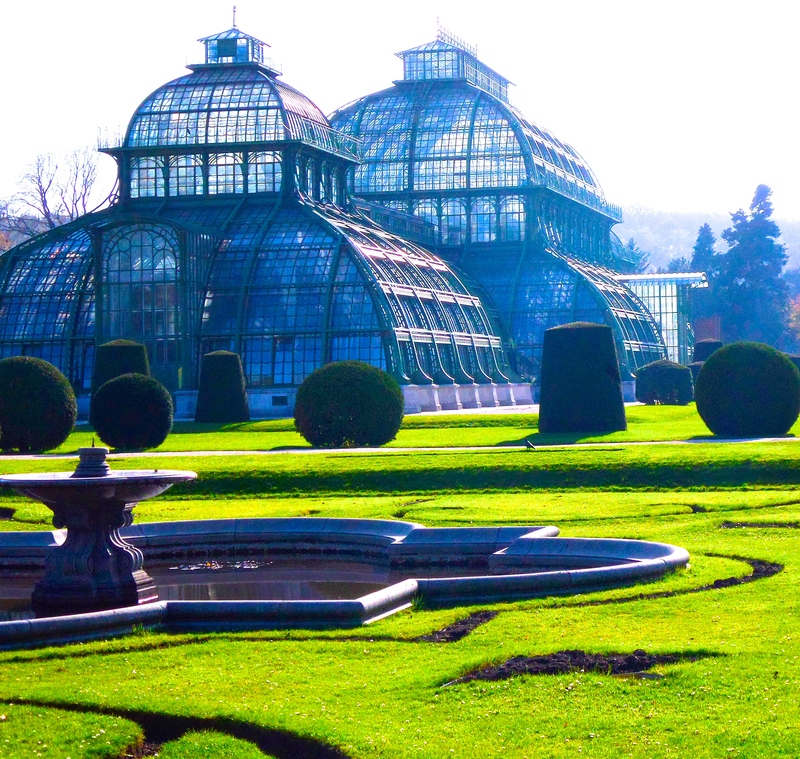 Another remarkable attraction adjoining Vienna Zoo is the Palmenhaus or palm house, which is yet another highlight of the Schönbrunn Palace garden. One of the last of its kind, the impressive palm house is a giant steel and glass construction over 110 metres long, 28 metres wide and more than 25 metres high. Linked by tunnel-like passages, the three pavilions of the palm house contain different climatic zones: a ‘cold’ house to the north, a temperate zone in the central pavilion and a tropical climate in the south pavilion. The necessary temperatures are achieved by steam heating, which means that rare plant specimens from all over the world can be grown in the Vienna Palmenhaus. Vienna Zoo is open every day of the year. See opening times; how to get to the zoo; admission costs; and details of where you can obtain refreshments. In Vienna, we stayed at the luxurious Hotel de France.